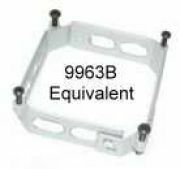 9963B equivalent mounting clamp. (3ATI, 1" DEEP CLAMP) This clamp is a ARINC 408 3ATI Square Clamp that is 1 inch deep. It is anodized per MIL-A-8625, Type 2, Class 1, Clear. Our new design of this clamp has a one piece band and lug assembly which makes it superior to our old clamp design. This part is equivalent to part numbers: MSP 9963B, NSN 5340-01-053-7184, NSN 5340-00-838-1478, NAS934901-03, 34753, 54621, 4000836-3, NSN 5340-01-564-3747, NH1002543-10, 6499-057, 150-5600-002, 2513-708-98233, 18289.